Our week started with a lovely day at Kew. Upon arrival at the gates, we noticed that they had signs telling us where to find different flowers; Cherry blossoms, Magnolias, Glory of the snow, Camellias and Daffodils. We used the co-ordinates given to locate the places on the map to see which flowers we could walk past on our walk to the rock garden. We spotted the Glory of the Snow and talked about how they were a blue/purple colour and star shaped. Later we spotted the Magnolia trees and examined the petals closely. Some of them were pink on one side and white on the other, while others were white on both sides. We also found a lot of Daffodils planted outside the Princess of Wales Conservatory and were able to compare the similarities and differences between them, particularly as we discovered a new type we had not seen before which had multiple petals instead of the normal tubular shape inside. In the rock garden, we explored some of the herbs, smelled the sage plants and watched one of the gardeners putting the labels around the plants. We tried out some new technology this week, learning how to operate the stop watches. We took turns running across the gardens and back, and comparing how long it took us. We were quite good at comparing the numbers and saying which was bigger, but it was a little trickier to understand that the smallest number meant we had been the fastest. Our walks along the lake at Kew have highlighted that the coots are preparing their nests ready for Spring. We counted four nests as we walked from the waterfall to the bridge and talked about how last year there had only been two nests. It won’t be long before baby ducks, coots and geese start to arrive on the lakes. We stopped to feed the birds at the bottom of the lake, tossing the pellets into the water where they were eagerly gobbled up by the birds. We also counted five herons around the lake which was surprising as normally we only see one or two! Our interest in den building has continued and almost daily a new den is constructed somewhere in the forest. Our skills for choosing and placing sticks is constantly improving, as well as our knot tying, with new developments, such as working doors that fit into notches on sticks. 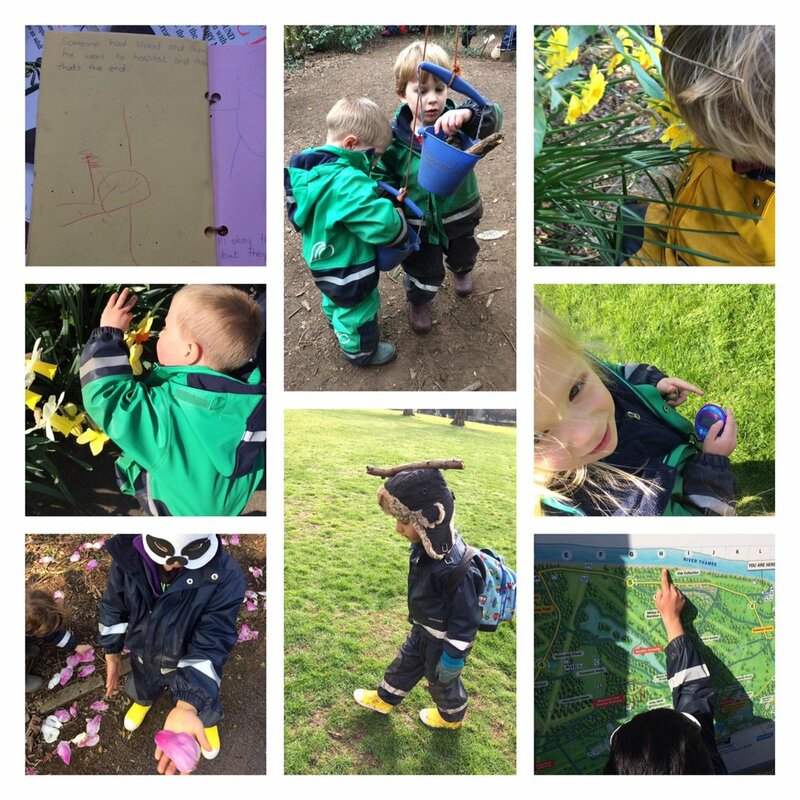 It is lovely to see the children’s interests continuing to grow each week. This week they began making cement from mud and water to help keep their sticks in place and a lot of teamwork was needed to dig holes, hold the sticks and place the cement around the base of the stick. We have also enjoyed creating our own books this week, using coloured paper tied together with string. The children have drawn pictures and then had their stories scribed onto the paper. It is great to see how their interests are reflected in the stories they create. We hope those who are not joining us next week for holiday camp have a lovely Easter break! Older PostFulham - Forest hotel!